South Korea’s “Garlic Girls” secured a much-anticipated semifinal victory in the women’s curling at the PyeongChang Olympics on Friday, guaranteeing them at least a silver medal. The four-member team, whose nickname reflects the produce their hometown is famous for, beat Japan 8-7 at the Gangneung Curling Center. The victory came after the team led by skip Kim Eun-jung had defeated higher-ranked teams, including favorites Canada and Sweden, becoming the first to qualify for the semifinals. Japan reached the last four for the first time ever on Wednesday, despite losing to Switzerland, to face Kim’s foursome. Korea appeared to be set for an easy win for most of the game, after scoring three in the opening end. But Japan forced two points in the ninth end to narrow the lead to one point. The match hung on the last stone in the 10th end. Korea had to take out a single Japanese stone to reach the final, but the contact was too faint and Korea’s stone slid further than it dislodged Japan’s. The uncharacteristic miss let Japan steal a point to take the score to 7-7 and force an extra end. 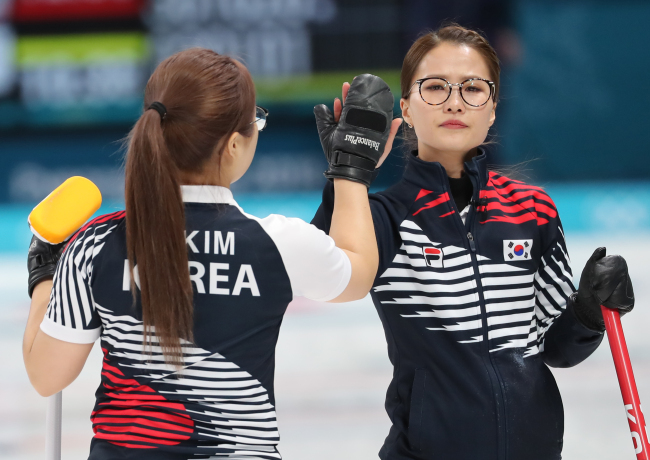 That end finished similarly, with Korea left with a single stone to beat with the final shot of the game, but this time skip Kim Eun-jeong made no mistake. Kim’s team is only the second Korean women’s curling team sent to the Olympics. That time, with a completely different set of players, Korea failed to make it out of the round robin stage, with three wins and six losses. The Korean team will go on to Sunday's gold-medal match, where they will play Sweden, who beat Britain 10-5 in the other semifinal. The Swedes came second in the round robin stage of the tournament, winning seven of their nine games. One of their only two losses was against Korea. That game was closely contested, ending 7-6 in Korea’s favor despite the Swedes being rated as having higher accuracy in the match. However their accuracy was higher in non-attacking shots, with Korea making far more takeouts with marginally more accuracy. Both finalists excelled in Friday’s games, with Sweden logging 86 percent accuracy overall while making more takeout attempts, and Korea's accuracy reaching 88 percent.